Hello, everyone, and welcome to The Corps! Friday! Note: confused? Read this blog post for the reason behind this change. We're celebrating this new feature by reviewing three figures at once, so let's dive right in! Desert and arid, low mountain survival and tactical expert. Third-generation member of the Royal Bengal Lancers. Works best solo. Prefers advanced guard or scout positions. The Bengal Lancers began in 1809, under the name "Gardner's Horse," called after William Linnaeus Gardener, the man who raised the cavalry regiment for the British Indian Army. After the Partition of India in 1947 they remained active, and are still part of the Indian Army today. Bengala is dressed in an outdated, stereotypical fashion: the first thing you'll notice is the turban, which is actually detailed fairly well - even Funskool, the company that produced GI Joe figures in India, never made anyone with a turban. Then he's wearing a khaki shirt with black suspenders, and ridiculous jodhpurs leading into black boots. 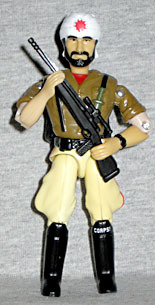 Some standard research reveals this to be the pre-1996 version of Bengala - the design changed in honor of the 10th anniversary of The Corps!, and that version traded his suspenders for a much fancier shirt, with armor and medals. 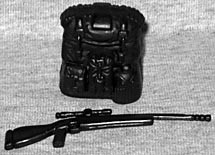 His accessories remain the same in both incarnations, though: a large backpack as good as anything seen on a G1 GI Joe, and a smooth black rifle. Long range tracking patrol and search mission specialist. Native American born, he uses his special skills in leading Search and Rescue missions as well as tracking enemy movement. Proving that Bengala wasn't the biggest caricature in The Corps!, we have Tracker Tom. He's basically Spirit, with the racism dialed up to 11. He may not have a loincloth, but he has decided to go shirtless and is wearing one of those traditional Native American breastplates, made of bone, beads and leather. He's wearing buckskins with fringe on the outside of the legs. At this rate, we're lucky he doesn't have feathers sticking out of his hair. That's not to say the head isn't as cartoony as the rest of him. He doesn't share spirit's braids, but he does have a red headband over his straight black hair. He'd look like Javier Bardem in No Country For Old Men if his skin weren't brick red. The date stamp on his leg is 1997, too - shouldn't we have been past things like that by then? Can you guess what Chief Whiskey-Chug's accessories are? If you said "a bow and arrow," then congratulations, you're properly tuned in to the level of cultural sensitivy running through 1980s toymakers' minds. He even gets a quiver that looks inexplicably like bamboo to hold his three arrows - arrows which have large, rounded tips, like he's firing bean bags at people. Ooh, how scary, Tracker Tom! Advanced combat field agent using the latest laser-guided technologies. Former lead engineer of new combat technology at a top secret government laboratory. Okay, okay, not all The Corps! members are unbelievable stereotypes - but they do all have ragingly stupid names. For instance, this cool-looking guy, whose name is Lars Lazer. Not Laser, "Lazer." The Z makes it exxtreme!! (The extra X is for "exxtreme" again). Other The Corps! names that we'll be reviewing in the coming weeks include "The Gasman," "Whispering Willie" and "Hat Trick Lemonade." Lars Lazer is a figure that would look 100% at-home among the old Joe figures. His design is tasteful, yet complex: his boots are armored, there are lots of nice pouches, a bandolier over the shoulder, and radio on his chest. The blocky helmet with the silver mask looks like something an Eel would wear. One thing you'll quickly learn when you start looking at The Corps! is that the figures were often repainted many, many times, to the point where there isn't really any "right" deco for them to have. This Lars Lazer is dark blue, with green and red accents, which identifies him as the first release - there are others that lack the red, some where he's green and brown... what have you. If you're going to collect vintage The Corps! toys, it's worth doing your research first to determine which colors you want to get. Older The Corps! 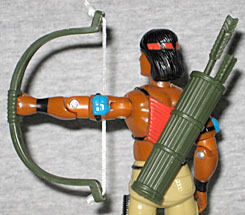 toys like these have articulation identical to Generation 1 GI Joes: balljointed neck, swivel/hinge shoulders, swivel biceps, hinged elbows, hinged knees, balljointed hips, and an O-ring waist. We can't say for sure whether they're built on the same buck as the Joes were, but visually at least, they'll blend in quite well. Here's to the start of "The Corps! Friday!"